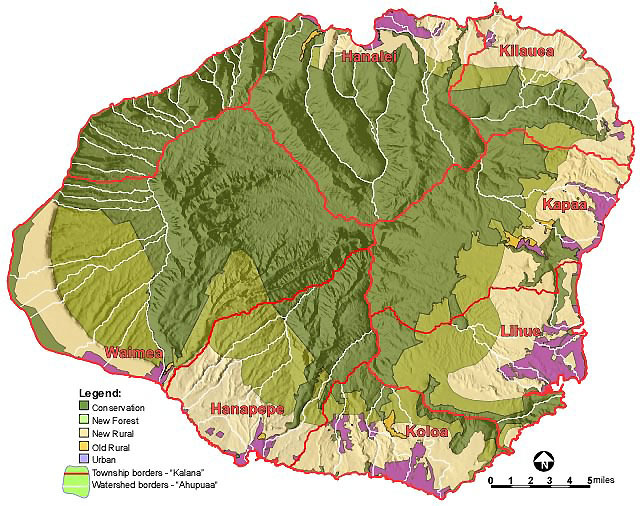 image above: Kauai Land Use Map Proposal advocated to sustain food production. Click on it to enlarge. On October 12th and 13th Kauai Community College hosted the LEGS (Locally Engaging Global Solutions) Sustainability Conference. It was sponsored by Apollo Kauai, and other progressive, environmental groups on Kauai. The conference included speakers, documentary films and panel discussions. I participated as a panelist under the subject of Land Use. 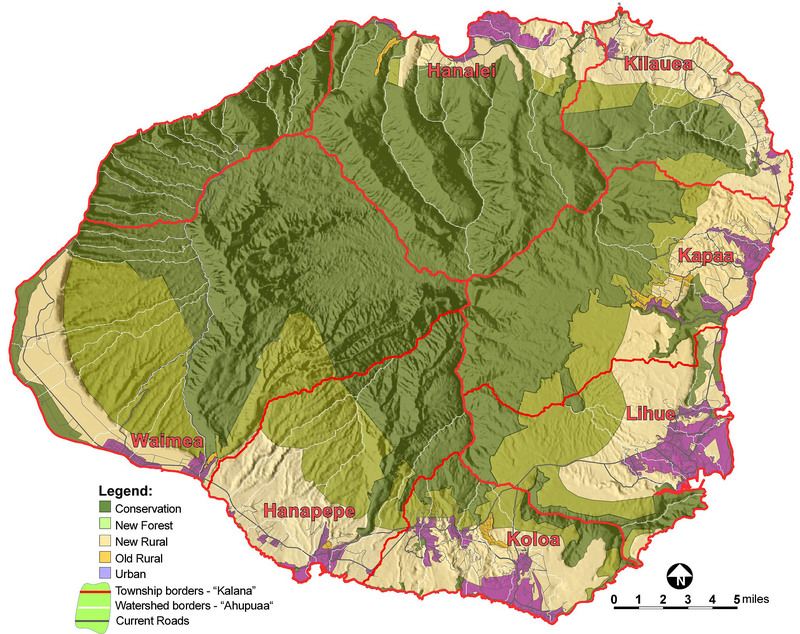 This article will summarize what we might do on Kauai to achieve sustainable land use. An important part of the LEGS concept was keeping the movement going forward after the conference ended. Featured speakers were asked to provide handout material that could be the basis of continued efforts on specific subjects like energy, food production and transportation. It is probably a good idea to begin with a definition of "sustainability". In preparing for the LEGS Conference I worked on my own definition. Using unrenewable resources no faster than they are recycled. Using renewable resources no faster than they are produced. Maintaining the health and biodiversity of the earth’s ecosystems. Maintaining the art and knowledge of human cultures. In general it is the idea of living within the means of our environment's resources, but more than that it means doing so while providing an enjoyable quality of life. Sustainability is not, however, a technique for the continuation of the status quo. That last bit is an important part of the responsibility we have going forward. The idea that going Green today means substituting a Prius for a Hummer and switching over to photovoltaics from the KIUC grid. That is maintainability, not sustainability. Going "green", as the corporations are envisioning it, won't cut it. More profound life changes are imminent. Crude oil is hovering at $95 a barrel. Ethanol, rather than solving the energy problem will simply make food much more expensive. There seems little doubt that with a falling dollar and the housing bubble burst on the mainland, energy and distribution systems will be greatly taxed. Here, on an outer island in the middle of the Pacific Ocean, we will soon begin to feel the pinch on our "non negotiable" life-style. Sustainability here will have to focus on providing our own food, water and shelter. Because we import 90% of our food, we will have to increase food production by ten times to meet the needs of our current population. At the LEGS Conference Dr. Adam Asquith, a biologist, made a presentation that concluded that our island, with a great deal of effort, will barely be able to feed itself. It is clear that any significant population growth, accompanied by loss of food producing acreage, will not be sustainable. Environmental and population collapse will be likely. is 55% percent of the island and includes mostly the higher center portion of the island. This area was generally too steep or too remote or too dry for agricultural use. is 40% the area of the island and includes all the areas that are relatively level and could be irrigated. Much of that was pineapple or sugarcane plantation once. is 4% of the island and represents the commercial centers, company towns and independent villages scattered around the island. They have been part of sprawl and strip development recently. is .5% of the island. It is the smallest category and is found generally in the lowland valleys where the Hawaiians once thrived. Water diversion from the valleys had much to do with unraveling that rural lifestyle in favor of the plantations. It is interesting that the Kauai General Plan focuses on the importance of maintaining a "Rural" lifestyle while so little of it remains (about 1/200th of Kauai). What people might mean by "rural" are the foothills of unutilized Agriculture fields framed by the distant mountains of Conservation forest. It is still a pretty sight, even to tourists caught in bumper to bumper traffic. But that vista is threatened. The large property owners that inherited plantation lands cannot make money growing sugarcane. Companies like Grove Farms and Alexander & Baldwin are itching to convert their thousands of acres into suburban development. What might save our agland as "rural"? Making it truly rural. My presentation to the LEGS Conference was to change the Land Use Map for Kauai. Urban and Conservation areas would not be changed. The Agriculture land use designation would be subdivided into two redefined land uses, Forest and Rural. It would be, like Conservation Land, non residential. Forest Land would primarily be covered with trees, shrubs and grasses. Forest Land would be low maintenance, used primarily to rehabilitate damaged ecosystems while yielding useful resources. Trees that grow easily and fix nitrogen could be encouraged to hold and rebuild topsoil. Crop trees and grasses would be harvested at a replacement rate. That could include kiawe, jute and hemp in the short run. As the soil becomes more productive and water is retained other species including koa and sandalwood could be grown. Forest land would be a buffer from more invasive human activity near Conservation Land. Forest Land could also connect and reinforce Conservation land that has become isolated or threatened. About half of the currently designated Agriculture land would be converted to Forest. These would be areas adjacent to existing Conservation areas and generally on the upper foothills of agland. Slowing water runoff from Forest Land would be an engineering challenge, but prove invaluable in retaining soil and making lower food production areas more productive. The other half of the Agriculture Land area would be designated Rural, but a slightly redefined Rural. New Rural Land would be the source of food for the island. Large scale monoculture crops like corn will not be able to feed us in the future. That technology requires too much fuel, fertilizer and pesticides (all crude oil derivatives). Rural Land would be dedicated to small-scale organic permaculture farming, the only healthy and sustainable option for the land and people of Kauai. Rural Land would allow farmers to live where they farm. It would allow for subdividing current Agricultural Land. The challenge is to permit such uses and avoid paving over our agland with more suburbs. Rural Land could be protected with several tools. I will mention two here. The first is Productivity Assessment. This tool would be unnecessary if our population was not so large and our island so small. But here we are. Java and Bali practice approximately what we would call permaculture. They are on rich volcanic soils and have pretty reliable rainfall. These locations support 250 people per square kilometer. That‘s about one person per acre of land. There are 81,000 acres of Rural Land in this proposal. Given the variation of productivity on that land, it is actually doubtful we could support our current population levels even if Rural Land was used to grow our food using organic permaculture techniques. Further research is needed but preliminary investigations indicate that of these 81,000, there may be less than 10,000 acres that are actually productive, high yield soils. These are mostly river bottom areas where pre-contact Polynesians did the majority of their agriculture. This relatively small amount of rich soil will become increasingly viewed by the members of our island community as a strategic security asset. Structures here will be small and devoted almost exclusively to the enhancement of food productivity. Parking lots? Driveways? Hotels? Sprawl. Not gonna happen. Today, to protect and maintain our communities, our county government is very careful to attend to its prime source of income - property taxes. We carefully assess land and buildings. We keep account of ownership and taxes due. We insist on building permits and infrastructure improvements, with an eye on protecting the "golden goose". A great deal of effort must go into this accounting for the commonwealth of the community. I suggest the same effort be made to keep food growing areas productive. All properties should be assessed for soil richness, topographical slope, wind, water access, and sunlight. Food production values should be assigned to each acre of Rural Land. In the future, I suggest, we focus on the food productivity of Rural Land with the same effort we now attend to the monetary value of property. If you want to live in a place in the country, you'll have to do some food growing, soil building or animal rearing. The second tool I'll mention to protect Rural Land is not delivering "The Grid" to every lot in every neighborhood. By "Grid" I mean the roads, private utility lines, county water and sewage system that support our suburban lifestyle. In today's eighth-acre subdivisions the "public" right-of-way are at least 20% of the land. They are expensive and will not be a useful investment in the future. I foresee, in the not too distant future, that energy production and recycling would be provided in local neighborhoods. Rural living would be in walking-riding-biking communities with a few short axle alternative vehicles on winding narrow lanes that lead to the nearest village. This would be a more pleasant and relaxed community, like old Hawaii. The suburbia of today would not work on this Rural Land. If you wanted to be where the action is (or don't want to tend the land), you can always move into town.